FILE - Supporters of Congolese political parties attend a joint opposition rally in Kinshasa, Democratic Republic of Congo, Sept. 29, 2018. The fractured opposition in the Democratic Republic of Congo announced Friday that opposition leaders will participate in a contentious December election, and said the opposition bloc will name a unified candidate by Nov. 15 — just six weeks before this pivotal poll. It's another sign of the volatility — and the fragility — of the situation as the massive and conflict-ridden DRC hurtles toward a long-postponed poll scheduled for Dec. 23. The divided opposition is hoping to defeat ruling coalition candidate Emmanuel Ramazani Shadary, who enjoys the support of longtime President Joseph Kabila. 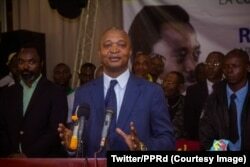 Kabila plans to leave office after refusing to step down at the end of his term in December 2016. FILE - Emmanuel Ramazani Shadary, nominated by President Joseph Kabila for the presidential election scheduled for December 23, speaks at a rally in Kinshasa, Sept. 25, 2018. After two days of discussions in South Africa's capital, Pretoria, the nation's seven top opposition leaders agreed on two critical issues, according to a document sent electronically to VOA by one of the leaders on Friday. First, they agreed to participate in the poll, despite reiterating concerns over a lack of political space and their mistrust in an electronic voting system that they believe is flawed or may be misused. Second, they agreed they will name a unified opposition candidate. But, says longtime Congo analyst Stephanie Wolters, the situation remains complicated. "I'm not convinced that ... these positions will remain common in the next two months," she told VOA in Johannesburg. "I think there's very high potential for these guys to fall out again. But for the moment, there is consensus, that the opposition is going ahead with these elections, and will just continue to try to push for greater credibility." The main issue, she says, is over who will be the presidential candidate. The electoral commission has declared three opposition leaders — two of whom enjoy immense popularity — ineligible for various, and contested, reasons. FILE - Vital Kamerhe of the Union for the Congolese Nation (UNC) is seen in Kinshasa, Democratic Republic of Congo, Aug. 4, 2018. Wolters says the opposition field is effectively narrowed to two men: longtime politician Vital Kamerhe and relative newcomer Felix Tshisekedi, whose late father led the nation's main opposition party for decades. Government spokesman Lambert Mende dismissed opposition allegations that the political playing field is uneven, and that the poll may not be transparent. "But why say that it will not be transparent?" he told VOA. "Are they God or what to know what will happen? Let it happen and then let them go to court to challenge." 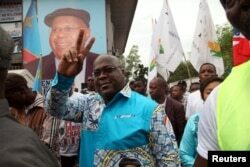 FILE - Felix Tshisekedi of the Union for Democracy and Social Progress (UDPS) gestures to supporters in the Limete Municipality of the Democratic Republic of Congo's capital Kinshasa, April 24, 2017. Mende said he's confident about the poll, which for the first time will be entirely locally funded after the government rejected foreign funding, accusing the international community of trying to influence the poll. "We are giving our people a chance to choose their leaders," he told VOA. 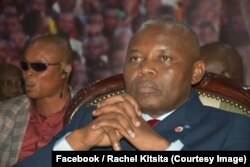 "And we know that a lot of people are abroad are fond of deciding on behalf of Congolese, and this time we said no. We stopped with this habit of people from outside deciding on who will lead Congo. We decided to fund ourselves, to budget ourselves." But Wolters says she's watching closely how things will play out — if the poll happens at all. "If this election takes place, there will be incidents, and if the ruling party candidate wins, there will certainly be incidents," she said. "Because people already don't believe in the credibility of this process, they're not comfortable with the situation. They're still as opposed to the Kabila elite being in charge as they were when Kabila was indicating that he might stay on."